Marshal's Gauge for SCA Armored Combat. It has 1.25" and 2" slots, as well as a 1"x.5" slot for testing weapon penetration into eyeslots and a 1" dowel for checking eyeslot width. Overall width is also 3" for checking tips on fiberglass spears. 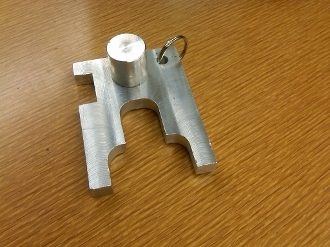 Machined from 1/4" aluminum.